For those not in the know, Bob Baldwin is a New York-born contemporary jazz pianist, music composer, author, and producer, who learned music from his father, Robert (Bob) Baldwin, Sr. Baldwin's recording career started in 1983. He has earned five SESAC Music awards, initially for his 2002-2003 airplay of "The Way She Looked At Me," followed by one for his 2008 airplay on NewUrbanJazz.com, one in 2010 for his Never Can Say Goodbye: A Tribute to Michael Jackson, and one in 2011 for NewUrbanJazz.com / Re-Vibe, and one for his disc "Twenty". His 2015 release, "MelloWonder / Songs In the Key of Stevie", which honors Stevie Wonder, debuted #16 on the Billboard Overall Jazz Charts. The Bob Baldwin love affair with Brazil began with his love of Antonio Carlos Jobim, Joao Gilberto and Sergio Mendes as a child. His love elevated when he witnessed the marriage of American Funk/Jazz and the Samba/Bossa Nova sound, which was later explored by the likes of Djavan, Ivan Lins, Elaine Elias, George Duke, Maurice White, and Pat Metheny. 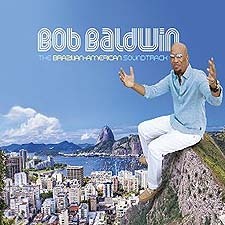 Fast forward, Baldwin follows up his experimental Brazil Chill (2004) disc with more flavors from Rio here on The Brazilian-American Soundtrack. Inclusive of covers by the aforementioned Djavan, Jobim and Lins, the result is a 26 track soundtrack through the eyes of this American - musically celebrating the year of the 2016 Summer Olympics, in beautiful Brazil. The 2 hour album, The Brazilian-American Soundtrack is a wondrous double album of both mellow and smooth musical offerings, all enveloped within some seriously tasty modern jazz - all delivered by one of the most talented keyboardists on the planet, Bob Baldwin. Funnily enough, in this age of getting things done yourself in this business, Baldwin actually teamed up again with PledgeMusic.com to bring his unique style and musical flavors to us. Using PledgeMusic.com to spread the word, and to offer unique items to those fans willing to donate to the cause, of course, The Brazilian-American Soundtrack was lovingly born. The Brazilian-American Soundtrack, fusing its elements of Brazilian, Jazz and R&B rhythms is a real treat for the ears of those in the Baldwin know - and all others that come upon him on their journeys. The only thing is you'll be very hard-pressed to list all your favorites and/or highlights from the double album as, well, they are all just so damn fine.